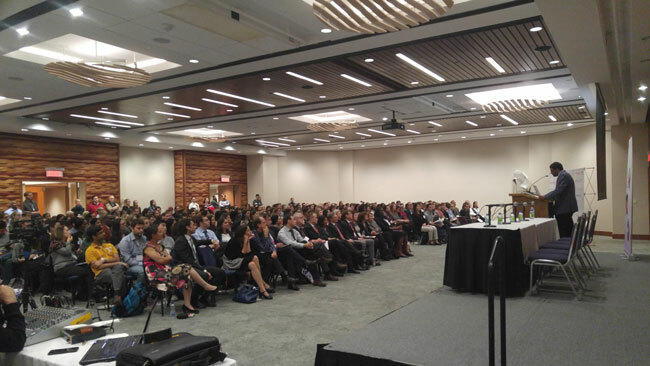 On Nov. 1, over 300 members of the McGill community participated in McGill Global Health Programs’ annual Global Health Night at New Residence Hall. The evening began with a poster fair, which provided attendees the opportunity to learn about the latest work from students representing a wide variety of disciplines. 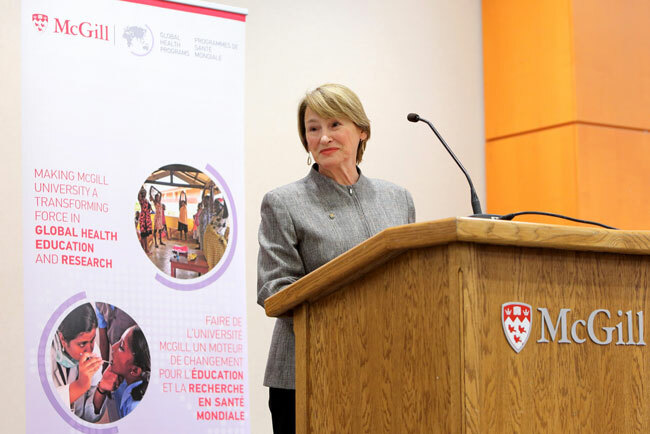 Before introducing McGill Principal and Vice-Chancellor Suzanne Fortier, Dr. Eidelman told the crowd of the recent Senate approval for the creation of a School of Population and Global Health, to be housed in the Faculty of Medicine. Principal Fortier followed, noting how impressed she is with the growth of global health at McGill. 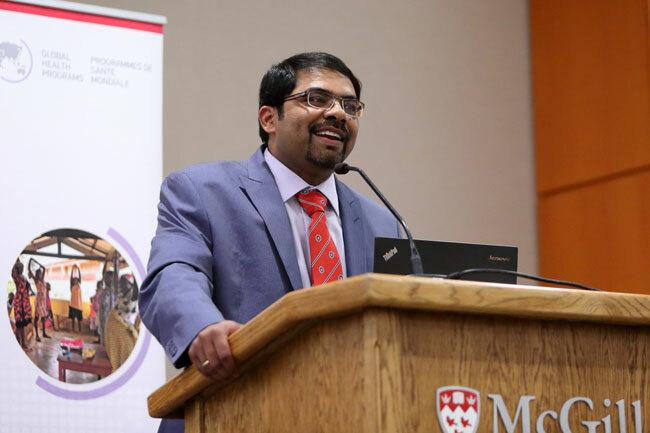 “We are very fortunate to have strong leaders in global health. I would like to congratulate all of our students, as well as our professors for their commitment to working together to tackle emerging challenges in global health.” Acknowledging the presence of the late Arnold Steinberg’s wife, Professor Blema Steinberg, and son, Adam (who also spoke at the event), Principal Fortier announced the most recent gift from the Blema and Arnold Steinberg Family Foundation, which now funds the Steinberg Global Health Postdoctoral Fellowship Program and the Steinberg Fund for Interdisciplinary Global Health Research. “Global Health Night is geared toward students, to highlight their work and help to generate excitement for global health on campus,” said Dr. Madhukar Pai, Director of McGill Global Health Programs, who followed Principal Fortier with a year in review of global health at McGill before introducing the night’s keynote speaker, Dr. Joanne Liu, McGill alumna and Médecins Sans Frontières (MSF) International President. Global Health Night also saw the unveiling of the new branding and website of the Global Health Blog launched in July, McGill Global Health Perspectives. This new initiative aims to provide a platform for McGill students and faculty to express their own opinions and perspectives on current global health topics. The blog has published a variety of articles, including opinion pieces, field notes, event overviews, photo essays, and book reviews. The night concluded with the presentation of Global Health Programs’ awards for students and faculty.